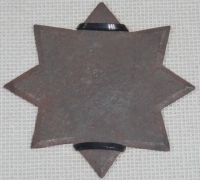 Among the weapons that ninjas use, the most famous one must be the Shuriken (手裏剣 : Ninja Star) . 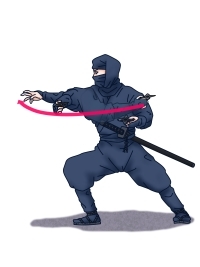 Everyone has to have watched a scene where a ninja is throwing some star shaped piece of metal in the movies or in an anime or another piece of fiction. They are called shuriken in Japanese. 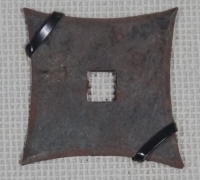 Of the several kinds of shuriken, maybe the most typical kind is the Flat plate type. The shape of it is like an asteroid with four arms. But actually, there are no more than 40 to 50 types of shurikens. Ninjas utilize those depending on the situation. Basically, shuriken can be divided into two types. 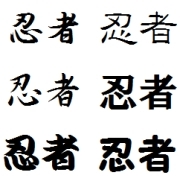 They are " The Plate Type " and "The Stick Type ". There is only one peculiarity which every shuriken shares and that is that they are so charred. This is because silk is covered onto a heated shuriken in order to cake the charcoal on the surface of a shuriken. This makes the shuriken less noticeable and prevents it from rusting. Also, the surface of a shuriken gets sandy and easier to paint poison on. Further to this, it becomes easier to throw it because of the gritty face and better grip. Originally, the function of shuriken was for self-defense. 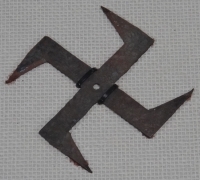 It is said that the mold of the shuriken was small knives or big nails. With such a small sized weapon it is hard to throw and aim it for a one shot kill. But if some strong poison like aconite was painted on the shuriken, it becomes a powerful weapon. Even if ninjas did not have poison, soil or dog droppings which existed all around them could be substituted. Most people think that shuriken was a specific weapon for only ninjas to use, however this was not the case. Primarily, shuriken was a weapon used like a sword, spear, or arrow just like a samurai might use. Though shuriken was a weapon that could stir the imagination of enemies, samurais came to avoid shuriken. It is certainly a fact that Shuriken-jutsu ( 手裏剣術 ) still remains in some Kendo ( 剣道 ) schools…. On the other hand for ninjas, shuriken was very convenient because it is portable and not so heavy. You may think that shuriken is s weapon " to throw ". But this is not true. 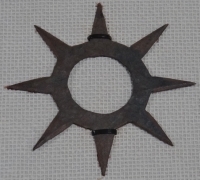 Shuriken was something used "to hit " a target just like with a sword or a spear. 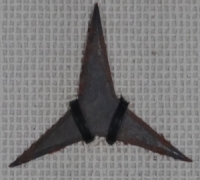 There is no exact established theory about shuriken yet although there are many persuasive theories. 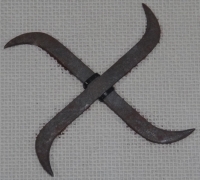 At first, in the Warring States period in Japan, there existed a combat technique of throwing knives at enemies. Shuriken usage can be thought of as an advanced skill. 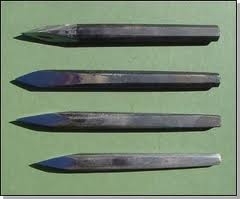 Secondly in old China, some people had utilized the technique of throwing three nails. With this method, at least one nail can hit the enemy. It is said that this technique was transmitted to Japan and became shuriken-jitsu. Next, there came to be a method of " throwing arrows " like big darts in old Japan. 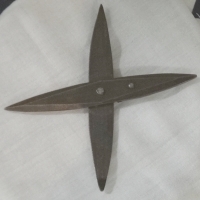 This can be thought of as ancestral form of shuriken. 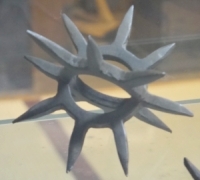 Ultimately, the origin of the shuriken can be considered as "throwing nails ". Nails themselves are small but they could give a reasonable amount of damage to enemies. 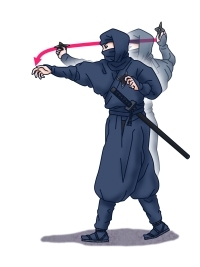 It is believed that Shuriken-jutsu developed from this technique. Now, we are going to go through the list of shurikens used in the past. Well, let’s start with the plate type shurikens. The most orthodox type. A folding type existed. 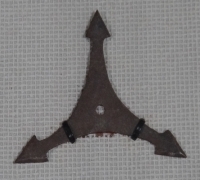 As corners of this Shuriken are sharp and deep, it can inflict a deep wound on targets. 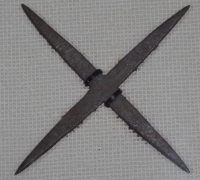 These are something that were originally made as shurikens and not as copies from another weapon or tools. This shuriken is for inflicting big damage on enemies. The angles of this weapon are double‐edged. Easy to stick to targets. The aim of these is to hurt enemies, rather than kill. A very orthodox form. In terms of the construction of the human body this movement is fluid. But in the case of the shuriken, no ideal form exists. Depending on the situation and position of the ninja at any point in time, they had to throw Shuriken with ever‐changing forms. Ninjas used this form when they threw shurikens from an awkward position where they had to lie down or sit and throw. 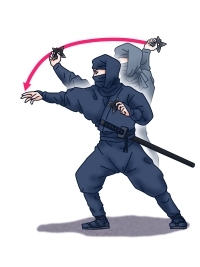 The advantage of this is that ninjas could use both hands to throw, and they can throw shurikens from a sitting position and lying position, or when running. We can often find this form in comics or anime. But this was not so practical. They needed a lot of strength and a sharp movement on their arms to use this method. 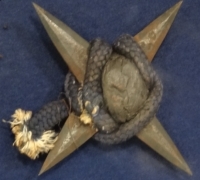 A certain theory says the origin of some stick type shurikens is the ritual implements of the esoteric Buddhism. 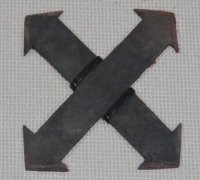 The shape of certain stick type shurikens look like that of Kongousyo (金剛杵) , which is an ancient Indiana religious tool to beat Demons. Ninja and Ninjutsu seem related on the esoteric Buddhism level in many ways. The stick type shuriken is hard to deal with for an amature. Although to hit the target with the shuriken is really difficult, the destructive power when hit on an enemy is great. In a lucky case, it is possible to take the life of the enemy by only one shot. The length of those stick type shurikens are between 120mm to 190mm. The weight is between 25g to 100g. The stick type shurikens are listed below. Weapons of spherical spines protruding in all directions. 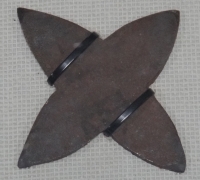 Two shurikens are assembled in a complicated shape. They easily stuck to a target, but were not portable due to their size and shape so they were only kept in possession at times of battles. Gunpowder was set in the center of the shuriken and a fuse was extended out. The use of Higuruma-Ken is bit different. These were used to light a fire and create explosions when they had oil on them. Fortunately, shuriken techniques still remain and there are some schools where Shuriken-jutsu is taught. Shuriken-jitsu is an actual master course for ninjas that existed in the past.